Elevate your weeknight dinner routine with these Indian flavoured kebobs that have a little sweet and a kick of spice. Our take on pesto blends peanuts, coriander and coconut for a dipping sauce that is big on flavour, and better for your budget. More great recipes can be found at www.peanutbureau.ca. 1. In a food processor, pulse peanuts, coconut, garlic and ginger until finely chopped, scraping down sides if needed. Add coriander and pulse until finely chopped. With the motor running, gradually add peanut oil then lemon juice until blended. Add salt to taste. 2. Oil grill and preheat barbecue to high heat. In a small bowl, stir garam masala with cumin seed, salt and cayenne. Pat shrimp dry and rub with spice mix. 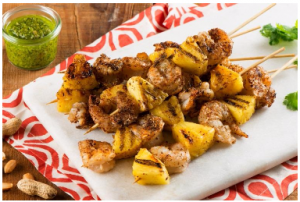 Thread shrimp and pineapple onto skewers. Grill for 3 to 5 minutes, or until shrimp are pink in colour. Place about 2 tbsp (30 ml) pesto on each plate as a dipping sauce, or spoon over the skewers.